SCAD and Fibromuscular dysplasia (FMD) patients attended a talk in November about FMD, given by Professor Alexandre Persu, European Fibromuscular Dysplasia Consortium Lead at the Université Catholique de Lourain, Belgium. The talk was hosted by the University of Leicester Cardiovascular Sciences Department. SCAD patients may also be diagnosed with FMD, so it was a great opportunity for members of the SCAD community to learn about the condition from a renowned expert. Professor Persu observed that FMD overlaps with SCAD, CAD (Carotid Artery Dissection) and migraine. Interestingly, many SCAD patients have also reported having migraines. However, migraine is a common condition with an estimated 1 in 7 people suffering, according to The Migraine Trust. Professor Persu said FMD is believed to be: idiopathic (ie a condition that arises spontaneously or for which the cause is unknown), segmental (can appear in different segments of the blood vessel), non-atheroschlerotic (not associated with traditional coronary artery disease) and a non-inflammatory condition. Patients with FMD have abnormal cellular growth in the walls of their medium and large arteries, according to the Cleveland Clinic. This can cause arteries with the abnormal growth to look beaded. Professor Persu described two types of FMD: multifocal, displaying the ‘string of beads’ appearance, and unifocal, having distinct focal lesions or tubular narrowing. FMD is a stable condition for the vast majority of patients he has seen. A very small number do progress quickly, though, and he said it is hard to identify which cases will do this. Professor Persu is investigating both the systemic and genetic aspects of the disease. He believes that FMD is a systemic vascular disease, usually with multiple arterial beds affected. Illiac FMD tends to be less symptomatic than renal or cervical FMD (in neck arteries). Cervical FMD may be more common than renal artery FMD. In the US FMD registry, multisite FMD is the norm. 35% have one or two sites of FMD, 20% have three or more sites. FMD has also been linked to other kind of vascular abnormality and other systemic inflammatory conditions. FMD might be a group of diseases. SCAD may be linked to FMD in coronary arteries in some cases. In terms of genetics, there are reports of some family members (siblings, twins) with FMD. In addition, Prof Persu has seen examples of patients with dissections in 2 arterial beds but no signs of FMD or connective tissue disorders like Ehlers Danlos. As yet he does not know why these dissections occur. The prevalence of FMD is unclear. At the moment FMD is observed in 0.02-0.08% of the population but in a study of healthy kidney donors, renal FMD was observed in 3-6% of donors. FMD is sometimes ‘silent’ – present but with no symptoms. Typically FMD is found in people aged 55-85 but it has been found to be the cause of stroke in infants and young children, although this is very rare. In the past, renal duplex scans were the standard diagnostic tool for FMD, but the current first choice screening tool is a Computed Tomography Angiography (CTA) or Magnetic Resonance Angiography (MRA) scan. But awareness needs to be improved in the radiology community to enable them to correctly interpret the images obtained. There is a big difference between ‘mild abnormalities observed’ and ‘FMD suspected’, he said. The more tortuosity in arteries the more likely someone is to have FMD. Any hypertensive women under 50 years old should probably be screened for FMD. If renal or carotid FMD is discovered other arterial beds should be checked too, including looking for aneurysms in the brain. A ‘brain to hip’ scan to check for evidence of FMD is advisable. In Belgium, he said, if a patient has severe renal or cervical FMD they are seen annually and have an annual renal duplex to monitor. Every 4-5 years they have a full MRA (more frequently if the patient has high blood pressure). Renal FMD can be helped by renal angioplasty (using a balloon to open up the narrowed artery), stenting is not recommended. Surgery is sometimes considered when there is an aneurysm on the artery. In some studies (North America) 85% of SCAD survivors show ‘evidence’ of FMD, but the true prevalence is still to be established. Professor Persu believes that it may be being over-diagnosed and that if tests are done ‘blind’ the percentage decreases. Dr David Adlam, who is leading the UK SCAD research project, believes the incidence in the UK group to be much lower. As with SCAD, research into FMD is in its very early stages and, although a number of interesting leads are being followed up, there are no concrete findings to share – yet. Assess disease progression (rapid progression of FMD is extremely rare, most patients are very stable, FMD patients who smoke are more likely to have a progressing form of the disease, so all are advised to give up). Establish a registry to collect cases for study. Establish a network of expert centres. Support the European Society of Hypertension in their work. The European Registry has 633 patients so far and Belgium has 166 patients in eight centres. Dr Adlam is working with Professor Persu to try to establish a better understanding of any possible link between SCAD and FMD. They will be working together on consensus statements and position papers to share with the international medical community. Patient support, as with SCAD, is important, and FMD-Be, a patient group, based in Belgium, is hosting a patient meeting in Brussels on 24 February 2018, where Professor Persu will be speaking. 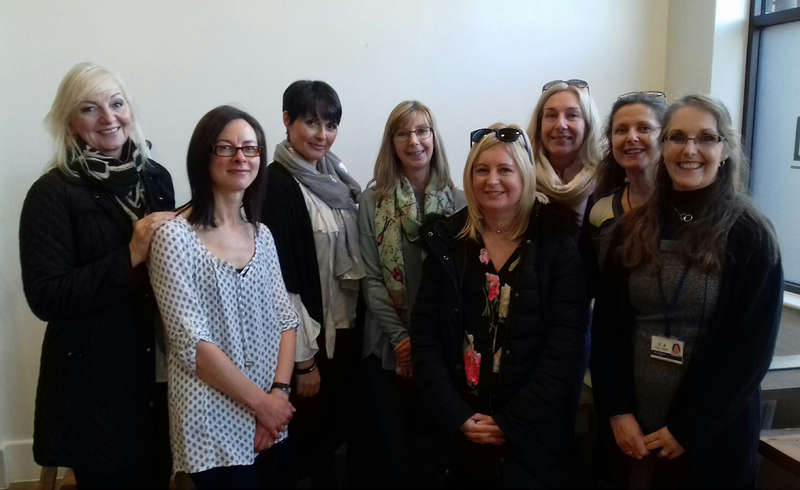 Pictured are SCAD patients (l to r) Denise Wilson-Pink, Suzanne Smith, Sally Bee, an FMD patient, Martina Fletcher, Lisa Barton, Sarah Coombes and Jaqui Hughes. With thanks to Sarah Coombes, who took notes at the presentation.